UNITED NATIONS, November 12 -- As a two-day "Culture of Peace" extravaganza began at the UN, three luxury tour busses with golden tire rims and blackened windows burst out of traffic on 42nd Street. They turned into the UN's compound, disgorging an entourage in dish-dash robes. Some carrying what observers called Aladdin lamps were whisked past security, to the side of the metal detectors. Meanwhile the Press was barred from the area in front of the General Assembly chamber, even blocked from covering the Security Council meeting at which, ironically, the Al Qaeda sanctions committee was being discussed. Trying to reach the meeting by way of the UN's basement, Inner City Press stumbled on a gaggle of security officers in front of Conference Room A. Minutes later, the Permanent Observer of Palestine came out, with another larger flotilla behind him. In the emptied room were tipped over water bottles and crossed Israeli and Palestinian flags. On the day before the conference, the UN's envoy Terje Roed Larsen was spotted on the fourth floor by the bank, in an expensive brown coat said to be of camel's hair. 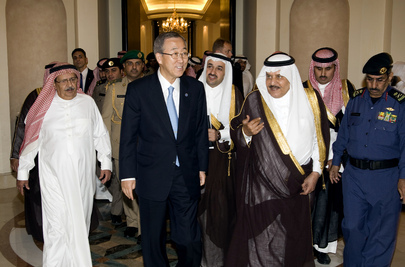 Beyond working in or through the UN, he heads a think-tank on the other side of First Avenue which is said to receive substantial Saudi funding. This conflict of interest is not disclosed, because Roed Larsen has not made the public financial disclosure that Secretary General Ban Ki-moon has called on all senior envoys like Roed Larsen to make. The man, it's said, has protectors. He is a diplomatic entrepreneur, who in this case seems to have arranged the lucrative renting-out of the UN's vacuum for two days. The night before the conference, there was bitter and some said petty talk about the impending deployment in the General Assembly hall of ceremonial chairs which are supposed to only be used during the annual General Debate in September. Suspects in veering from the past include Protocol and the head of the Department of General Assembly and Conference Management, Shaban Shaban., who had yet to hold a press briefing. "If you let the Saudis break even this precedent," one well-placed staff member complained, "then others will ask start asking the same." But what others will rent out hotels and pay other delegations' costs? General Assembly President Father Miguel d'Escoto Brockmann, asked about the event, said that while he wrote the invitation letter, the idea had come from Saudi Arabia and Ban Ki-moon. He did not answer Inner City Press' question about the role of Terje Roed Larsen. When asked about the pending GA resolution against the defamation of religion, he said he hadn't heard about it, adding regarding the United States that "those who live under glass houses shouldn't throw bombs." How about those in a glass building?